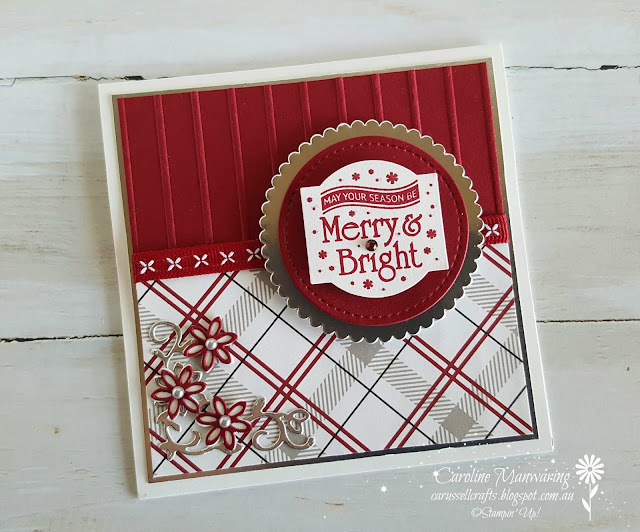 Tonight I'm sharing card #4 in my little square card series and we're up to Week 14 of the Heart of Christmas blog hop with the Art with Heart team. I chose a pattern from the Festive Farmhouse Designer Series Paper for the lower panel and the top panel of Cherry Cobbler cardstock is embossed with the Simple Stripes TIEF. I haven't used this ribbon for a while, so I thought it was time I did, it's the 1/4" Double Stitched Ribbon in Cherry Cobbler, and I just wrapped a length around the panels to cover the join. I've layered these panels onto a piece of silver foil. 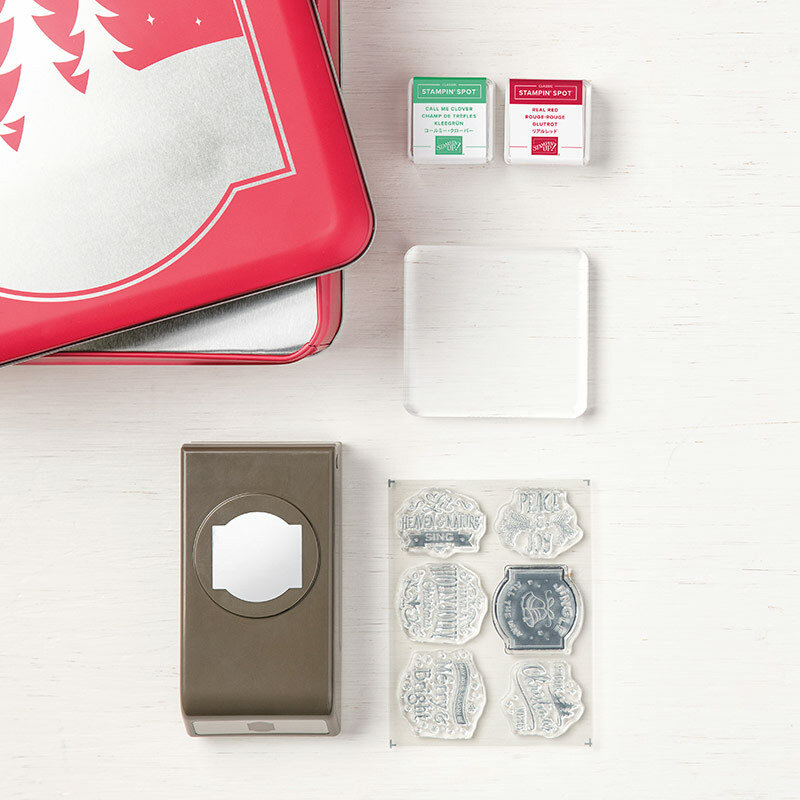 The sweet sentiment is one from the stamp set that comes in the Christmas Traditions Punch Box and it's punched out with the punch that's included in the box as well. 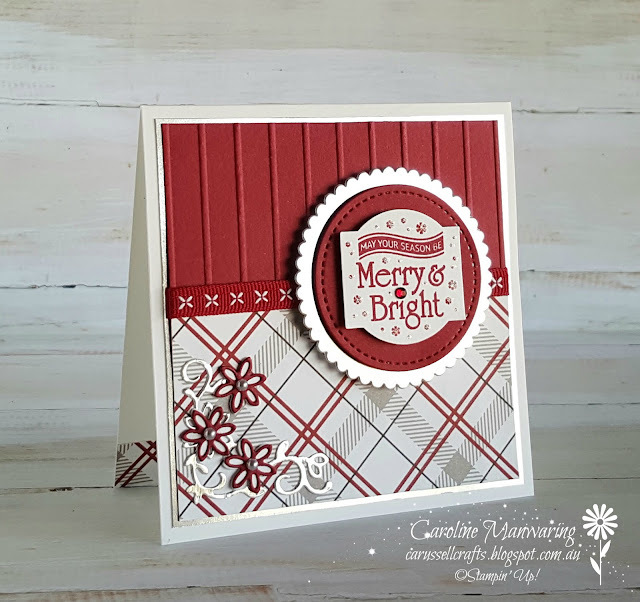 I've stamped it in Cherry Cobbler ink and added little dots of sparkle with the Wink of Stella pen over the dots and snowflakes and popped a rhinestone, coloured in with the Dark Cherry Cobbler Stampin' Blend marker, over the 'i'. 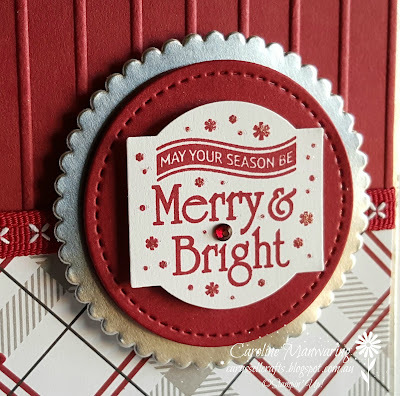 I added some little die-cut elements to the lower left corner in silver foil, Cherry Cobbler and Whisper White. 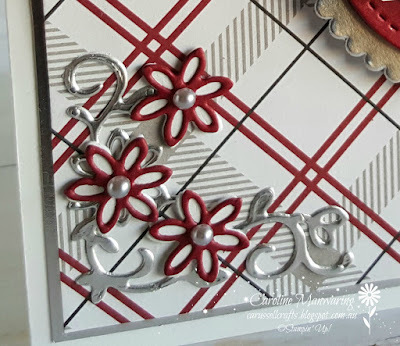 These dies are from the Detailed Poinsettia Thinlits. I added silver metallic pearls to each flower centre. So pretty! 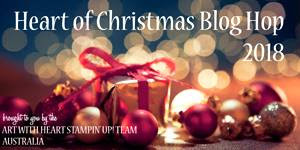 Our lovely Kate Morgan is hosting tonight's Heart of Christmas hop this week, use her link below to see more Christmas inspiration from the team. See you all again next week.